Dance competitions are a real test of endurance. You often have to drive a ways to the venue, spend time warming up, do multiple performances over several hours. Not to mention that you may have a few competitions packed into just one weekend! To dance at your best, you need to be in tip-top shape physically, and it starts with good nutrition and having some high-energy snacks on hand. It’s vital that you give your body the energy it needs to dance in peak shape, and this means providing it with fuel throughout the day with healthy snacks designed to keep you on your toes – literally. Balanced snacking before and after your competition helps keep your muscles’ stores of glycogen at their highest levels, which improves your performance, and helps ward off the nasty effects of a low glycemic index, which can cause fatigue, dizziness, muscle weakness and blurred vision, according to Central Washington University’s Department of Sports Nutrition. In an ideal world, chocolate bars would provide all the energy we need with none of the sugar, fat or calories! Until scientists engineer some miracle food like that, it’s important to be strategic when putting together your snacks. Avoid white starches and refined sugars, since these give you a quick boost but then make you crash, noted Harvard Medical School. Instead, opt for snacks that contain complex carbohydrates and a small amount of healthy unsaturated fats or protein. Also, steer clear of “power bars” in stores. While these products claim to have the perfect balance of nutrients to boost your energy, many of the claims are just marketing. An Ohio State University study revealed that power bars aren’t any better at giving you sustained energy than candy bars are. Try the ideas below to make sure you don’t slack on the snacks. This snack idea from the Boston Ballet will help keep you full throughout your competition. Half a whole wheat pita provides you with energy-boosting complex carbohydrates, in addition to 6 grams of fiber, according to Livestrong.com, and pitas won’t make you feel bloated like regular bread might. The peanut butter contains protein and healthy fats, a winning combo that will help you have the energy to perform at your best. For another great-tasting twist on this snack, try swapping the peanut butter for 2 tablespoons of hummus and a hard-boiled egg. The cottage cheese contains protein and Vitamin D, which is a source of energy, noted Healthsomeness.com, and will keep you full for a long time. Strawberries add a little sweetness without unhealthy sugars and also give you a dose of antioxidants, while mini whole-wheat bagels provide some complex carbohydrates. 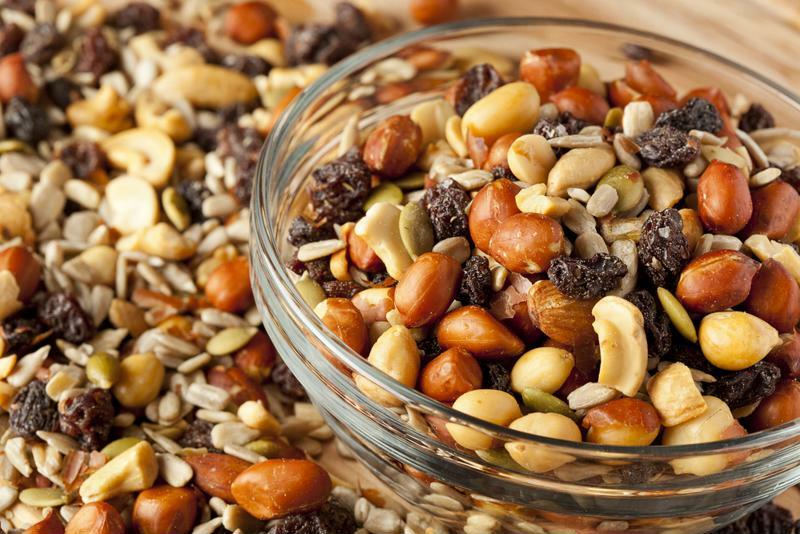 Make your own trail mix with your favorite ingredients and then pack in a bag to take along to competitions. Your Daily Dance recommended that dancers pop a bag of popcorn before they leave the house and tote it with them to the competitions to snack on throughout the day. Popcorn is a fantastic source of whole grains that contains vitamins that help your muscles release and use energy. Mix in a handful of nuts or yogurt-covered raisins with your popcorn for a well-rounded snack. “Popcorn is a great snack because you get a lot of volume and fiber (which makes you feel full), and it’s a whole grain, so it’s healthier than a snack like pretzels,” said Tara Gidus of the American Dietetic Association in an interview with Fitness magazine. Surprisingly, vegetables contain a high percentage of carbohydrates, according to Livestrong.com, so they’re a great choice for an energy-boosting snack. Pair sliced veggies like carrots, cucumbers, peppers or zucchini with Greek yogurt for a yummy low-fat dip. The Boston Ballet suggested adding a little chopped parsley or chives and lemon juice to the yogurt to spice up the dip. The morning before a competition is always rushed, so don’t leave putting your snacks together to the last minute. If you’re scrambling and forget to bring along any snacks, you’re more likely to be tempted to hit up the vending machine or bake sale to ease your appetite later in the day. The night before the competition, package your snacks in plastic containers and baggies to have them ready to go in the morning, along with any ice packs to keep perishable foods cold. Try to avoid eating snacks that easily spill or stain while wearing your costume, but if you must, make sure you wear a sweatshirt or jacket over it just in case. And finally, remember that snacks don’t replace meals, so be sure to eat balanced meals throughout the day. *Editor’s note: Be sensitive to the possibility of peanut or tree nut allergies among other dancers. Be sure to consider those with nut allergies when deciding what to bring, and remember that some severe allergies can be triggered by contact with very small amounts of the allergen.